...It contains omega-6 fatty acids and ingredients which improve condition of your scalp. Check the properties of grapeseed oil and if it is going to help your hair. What is a grapeseed oil? Grapeseed oil is extracted from the seeds of Vitis vinifera. The cold-pressed, unrefined product is the best one. Grape oil will last longer if you store it properly. Keep it in a dry and cool place, away from light and air. Grapeseed oil is used in cooking and cosmetic industry. It contains antioxidants, vitamins A, C, E and linoleic acid. 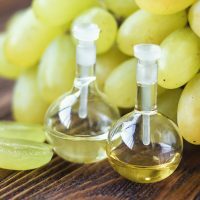 When to use grapeseed oil in hair care? Grape oil is recommended for high porosity hair because it consists of large particles which easily penetrate through highly raised cuticles. Besides, it belongs to the group of polyunsaturated oils which contain omega-6 and omega-3 acids. When to use grape oil? If you struggle with greasy scalp, you have greasy or dry dandruff, your scalp is itchy and irritated – try out grapeseed oil. It stops the development of bacteria and fungi which are responsible for scalp diseases. 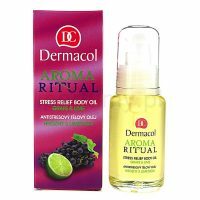 What is more, the oil nullifies itchiness and redness as well as controls the work of sebaceous glands. It is going to restore proper pH on the scalp whereas vitamin E is going to keep your hair in good condition and prevent premature greyness and hair loss. If you have dry, dull and damaged hair, the cosmetic should help. Use it regularly and it will repair your strands and restore healthy shine. If you massage it in the scalp, it will improve blood circulation, strengthen hair bulbs and boost hair growth. 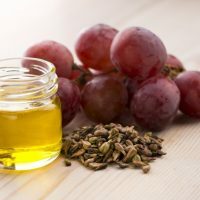 How to use grapeseed oil? Grape oil can be applied to hair and scalp. It is a great product for hair oiling. Rub a small amount of the product in mid-lengths and ends. Wash your hair with a mild shampoo after a few hours. Repeat the treatment before every scalp wash or once a week. Grapeseed oil is suitable for hair oiling as well. How to do it? Apply a large amount of the cosmetic to hair and/or scalp. If you want to achieve spectacular effects, put on a shower cap and wrap head with a towel. Heat is going to open skin pores and hair follicles. As a consequence, the ingredients of the grape oil will penetrate inside hair and scalp more quickly. Wash the product down after several hours. Effect? Beautiful, shiny and smooth hair without dandruff and split ends.